In the last few years, lack of accessibility within the tourism sector has been gaining awareness. In many cases, this has been reflected in better information for facilities or more accessible venues. However, there are many global experiences that, by default, seem out of reach to disabled travellers. Wheel the World (WTW) works to reverse this idea. Since 2016, WTW has been leading treks for travellers, disabled and not, training local guides to accommodate different types of disabilities, and creative viral campaigns to raise awareness of their activities. We spoke to Alvaro Silberstein, co-founder of Wheel the World, to learn more about what they do and the impact that they have in the global tourism industry. Read on to see what he told us. We live in a world that has not been designed for people with disabilities. For that reason, people with disabilities have had less chances to live to their fullest and appear to be ‘inactive’ by others. However, in the past 10 years the world has started to change into a more inclusive one. Societies and governments are demanding products, services, organizations that are also designed to serve people with disabilities. This has resulted in disabled people being increasingly more active within tourism and recreational activities. 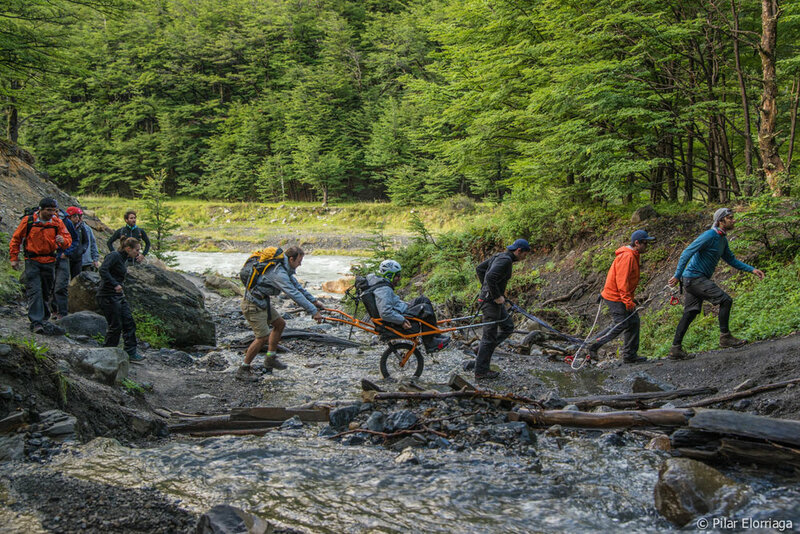 Less than one year ago, we started Wheel the World as an organization to develop outdoor experiences for people with physical disabilities in natural wonders of the world. Our first project was in Patagonia, Chile, where we started the first trekking and kayaking program in the region. We filmed a documentary to inspire disabled travelers to have this adventure and it became viral. We have received hundreds of requests from other disabled people wanting to do the experience too. In 2017, we launched two other programs: one in Easter Island and the other one in the lake district in Chile. After eight months working on this projects, doing market research and customer development, we have learned that people with disabilities, are in fact, willing to pay for these cool experiences and the disabled travel market is growing at an annual pace of 17%. Unfortunately, travel tech companies have not been able to figure out how to serve the disabled market which has likely led to the fact that disabled travellers better trust services that are 100% disability focused. 1. We enable WTW experiences in famous tourist destinations, where we partner and train local tour operators, creating a full inclusive touristic service, considering accommodation, transportation and activities. 2. We create audiovisual content that become viral on social media and press to inspire people to travel by WTW. 3. We facilitate planning and booking process through our website for people who want to do WTW experiences. We are giving people with disabilities access to travel to places that they thought were out of reach for them, changing their lives and also the lives of their families and friends. We’ve provided +300 experiences for people with and without disabilities (counted as 1 person in 1 day of activities). Our experiences have changed 150 people’s lives (25 with disabilities plus their companions). We have validated that people with different disabilities and their friends want to have unique experiences together. By WTW, they realised that hiking Patagonia or Scuba diving in Easter Island are doable activities and took action to experience them. We already enabled 15 activities in 3 touristic destinations: Patagonia, Easter Island and Cochamó, producing 3 documentaries, and having +60 appearances worldwide. We managed to sell USD 120,000 in sponsors and users. Having only been operating as an organisation for less than a year, we are so impressed with what Wheel the World has been able to accomplish. We are looking even more forward to what they can do in these 3 intense weeks and after. You can find more information on their startup on their website or come back to our blog to see more updates on how all the startups are getting on.